Make a BIG Impression for your next Special Occasion! 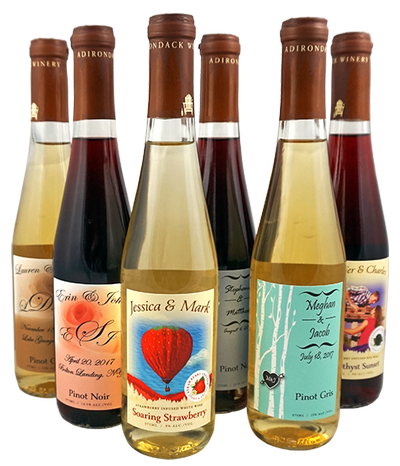 Choose your Wine Label Template, and we'll customize it with your wording, special artwork or images, logos, etc! If you would like to order more than one wine type, please call (518) 668-WINE to place your order. (Quantity discounts apply to each wine type only, wine type quantities cannot be combined for discounts). Pickup at the Tasting Room, or have your CUSTOM wine shipped to your door (minimum lead time is 6-8 weeks - Don't have that much time? Check out our Personalized Wines). NOTE: Adult (21+) must sign for package and be present at time of delivery – package may not be left unattended. Custom-labeled wine is excluded from free shipping. Shipping quotes reflecting our actual shipping cost will be provided upon request. Choose in-store pick-up to avoid shipping charges.